This chalet has marvellous views all round, and its decor is in character with the region. Conveniently located for skiing, having direct piste access from the chalet back garden or a short drive of a few minutes to the ski stations and ESF ski school. The chairlift is a 8 minute walk uphill or you can drive. 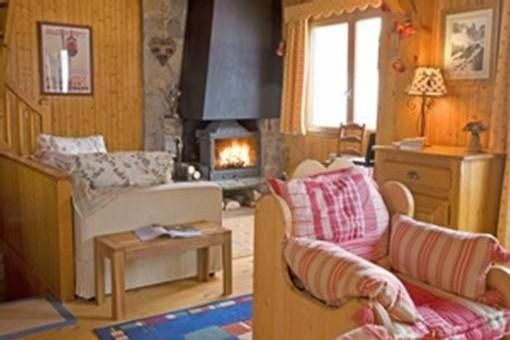 The chalet accommodates 4/5 adults or 1 or 2 couples with children. The large oak dining table seats up to 8 ( if you have visitors). The lounge area seats 6 and the sofa bed is a double. Also a wood burning fire. Access to the balcony, which has table and chairs is from the lounge/dining area and also from exterior stairs. The kitchen is fully equipped with large stove and oven, microwave, small oven/grill, fridge and dishwasher. Cooking utensils, cutlery and dishes are supplied. Coffee makers,coffee grinder, teapot, toaster, fondue and raclette provided. Also a large fridge and deep freeze . Three bedrooms upstairs, two with double beds and the third with two single and one sofa bed. The large bathroom is located on the same floor and has a bath ( with hand shower), a bidet, a washbasin and a toilet. The main floor of the chalet has a shower/utility room with washbasin, shower enclosure and washer and drier machines. Also a separate toilet. The ground floor has storage cupboards for skis, boards an boots and outdoor wear. The private drive has parking for 2 cars. There are two flat areas next to the chalet, suitable for having a barbecue. Access to the piste is from the rear hillside garden. Any time of year here in the chalet is a good one ! Easy access to mountains or village or places of interest in the region. 4 minutes drive from Tunnel Mont Blanc and to Chamonix from Les Houches village. Bathroom 1 is located on the second floor and bathrooms 2 and 3 on the first floor. Electric radiators and the wood stove. White quality linen supplied for all. Large heat output woodburning stove. You may purchase wood from the village supermarkets. There are 2 fridges. One medium sized with freezer unit in kitchen and one tall unit. Large capacity with grill and fan assisted oven. Choice of Caftiere. Filter, Perculator. Multi- slice, wide gauge for rolls, baguettes. Mini oven has a grill . Fondue pot, Roasting casserole tins of different sizes.....Seafood cutlery, various large knives.. Raclette. A large oak dining table, can seat 8 persons. 2 outdoor dining tables and 2 Barbecues. Large screen. English and French channels. Basic portable CD player/ tape/radio. Plus a large selection of DVD s to choose from. Fact, fiction, historical ,geographical, cookery .... Mostly adult reading, a few children's books. Children's games, dominos, puzzles, cards etc... Scrabble for adults. Childrens' sledges. Wide range of videos . 2 flat areas for summer dining and barbeques. Garden chairs, tables and sun loungers. Large dining/sitting balcony with table, chairs, loungers, accessed from outside by steps or from lounge by patio doors. Locking Bicycle shed. Arrange in advance. Two flat areas, side of chalet, front of chalet. Storage lockers in ground floor. Shops in village nearby. 15 minutes drive to Chamonix. Chalet Altitude has fantastic views from every window and the large dining balcony looks on to the Mont Blanc Massif Mountain Chain and down the valley to Chamonix and the Mont Blanc Tunnel , both only 15 minutes away by car ! Italy and Switzerland within easy reach... The chalet has a private drive, and you can park on the drive or at the top. It is accessible to all car types, but in winter it is advisable to park at the base of the drive. Bring snow chains in winter, just in case of heavy snowfall ! A car is essential for families and most visitors (but not ALL visitors) to access mountain hiking, biking ,climbing, ski shops, supermarkets,cafes and restaurants, cable car. These are 20 minute walk away downhill/ 30 minutes uphill. The Tourist Office and Post Office and supermarkets are further along the pretty alpine village of Les Houches. There is a secure bike shed. On request, a pet may be allowed in summer months, June to September. Sorry, no pets in winter ! You do need a car to stay at this chalet due to its location up the mountain roads and my only negative comment is that the drive is very steep and when covered in snow it is slippery and when the snow was melted away by salt it became quite wet and muddy. Its always a delight to get a positive review from guests , saying that they enjoyed their stay at my chalet. A holiday is a seriously important event of the year and I do my utmost to make their chalet visit enjoyable in every aspect. Its a vicarious pleasure! I did want to respond about the issue of the chalet drive. The week 18-25th February had exceptionally high temperatures for the time of year- fantastic weather, but it caused a lot of thawing in daytime , then freezing at night , and ice! So, it got slippery in the drive and I do apologise to my guests for that. They were great visitors to have to stay. There had been a large snowfall the week before and I normally clear the drive, just prior to my guests arrival, but the guests of the previous week arrived much earlier than scheduled and wanted to park in the drive. The weight of their vehicles compacted the snow into hard-packed ice. Salt was then scattered over the drive which melted the ice, but the lower base of the drive became wet underfoot and a bit muddy. In summer, I will order several loads of gravel for the drive to ensure this does not recur! I state that a car is essential when staying at my property, but interestingly, this year, I had a family from Paris with 3 young children, who did not use their car for their entire stay of a week. They had stated they intended doing that when making the reservation and they brought supplies with them and any necessary shopping was done by skiing down and coming back up to the chalet by chairlift/ telecabine. The complimentary skibuses at the Prarion cablecar station are regular transporters of skiers to shops in Les Houches and Chamonix. Cosy family chalet with very complete equipment. Janet is charming and most helpful. A great place for kids ! A great place to relax and as an apline base! We have stayed twice now at Chalet Altitude, actually booking our second stay whilst there the first time! We were made to feel welcome even before arriving, the owner being prompt in replying and helpful in providing all the information that we required. The chalet was exactly as we expected it to be from the photos and info received beforehand – bright, spacious, clean, with a FANTASTIC view of the Chamonix valley. There was an excellent range of cooking equipment which was all well utilised. Everything in the chalet worked – TV, wifi, all cooking equipment. All the beds and bedrooms were thoroughly cleaned and all of a good size, all with superb views again. With easy access to the piste – some 30m away, all was happiness and contentment with the skiers in our group. Needless to say we are now booked in to visit again next year, and are looking forward to it already! Merci bien Jan et Monique! interior and exterior, located on a sunny hillside next to the ski piste and trails of the village of Les Houches in the Chamonix valley. Set in peaceful and tranquil spacious surroundings, yet it is close to all facilities and services. Marvellous views of the Mont Blanc Massif Mountain chain - this is an all-seasons chalet. Chamonix is a 4 minute drive from Les Houches and also the Mont the Mont Blanc Tunnel, leading to Italy . The Aiguille du Midi cable car is a thrilling journey giving panoramic views of the Valley. Also, there is a chairlift, a 4 minute walk uphill from the chalet and this connects to another lift which takes you up to the top of the mountain and the plateau, with cross-country and snowshoe trails to be found as well as downhill skiing and some ski school classes rendez vous. Plenty of mountain restaurants around! Walking downhill from the chalet, a 4 minute walk - 2 bends downhill - the Bellevue piste can be accessed, taking you to the Bellevue cablecar station . Both the Prarion and Bellevue stations are located in Les Houches village and have car parking. Both stations just a few minutes apart. Golf: The nearest golf course is the far side of Chamonix town, about 20 minutes drive. There is a free bus , with a stop next to Prarion station and Bellevue cable car station, which will take summer and winter visitors to many other areas in the Chamonix Valley. It also operates in summer and its complimentary to visitors. The local ski area caters for all levels of skiers and there are plenty of runs to try out. Ideal for all the family! Payment through HOMEAWAY for deposit / balance. Rental rates include electric heating, bed linen, towels, electricity, gas, taxes, end of stay cleaning, children's items, unlimited free WiFi and satellite TV. Damages deposit of 200 cheque required . Firewood is an optional extra and can be purchased in the village/ at the chalet.